What Is Single Payer Health Care? Due to obstructionism by Maine’s House Republicans, the legislature failed to complete actions to fund Maine’s Clean Elections program for the 2018 elections. Candidates must now collect all their $5 donations to the Clean Elections fund well before June 30. If they don’t, they won’t receive full funding and they will be seriously disadvantaged running against traditionally financed candidates. Any funds must be disbursed by June 30, which means you should make your donation by June 20. Why this matters so much: Most Democratic legislative candidates in Hancock County are running as Clean Elections candidates. For each additional 15 qualifying $5 donations, House candidates receive $1,275 to a maximum of 180 qualifying contributions. For each additional 45 qualifying $5 contributions, Senate candidates receive $10,200 to a maximum of 535 qualifying contributions. This means they need to collect as many $5 donations to the Clean Elections fund as possible – NOW. Delays may seriously damage their ability to wage effective campaigns against traditionally financed Republican candidates. Follow directions to contribute $5 to each candidate of your choice. It really is that easy. So just DO IT! One of the bills caught in the crossfire is LD 1894 An Act To Correct Errors and Inconsistencies in the Laws of Maine. There was a drafting error regarding funding for Clean Elections in the biennial budget passed at the 11th hour last summer. 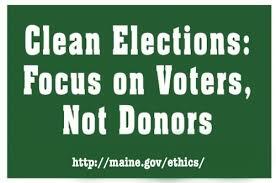 Because of the way that budget bill was worded regarding the early transfer of $3 million from FY 2019 to FY 2018, the error prevents the Ethics Commission from disbursing money to candidates from the Maine Clean Election Fund after the end of this fiscal year, June 30, 2018. To make matters worse, it now appears that candidates participating in the Clean Elections program will not be allowed to raise private money to make up the difference. The Maine Clean Election Act provides that participating candidates may raise private money to finish their campaigns IF the fund runs out of money. In this twisted circumstance, the fund is NOT out of money. The fund HAS plenty of money. But the Ethics Commission is not allowed to disburse it. Everyone agrees it was a drafting error. Remember, this is not more money, just moving the money from one year to another. The legislature attempted to fix the problem in the so-called Errors Bill, which normally sails through unopposed. Not this time. This is among the “undead” bills remaining for legislative action when and if the legislature comes back. We need a special session, and we need this bill to pass. Candidates and voters from all parties have been relying on the Clean Elections program. We have three gubernatorial candidates already qualified, and now hundreds of legislative candidates have qualified, too. This funding was part of a bipartisan budget deal hammered out last year. There is no legitimate reason for House Republicans to renege on that deal now. You can find contact information here. Tell your representatives how much you want them to fix this problem.